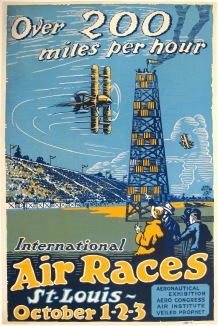 Vintage original small format event advertisement poster for the International Air Races of St. Louis, Mississippi. The event was held at Lambert Field, Bridgeton, Missouri in October 1923, and on the race day attracted 140,000 spectators. Linenbacked. Some restoration to top corner and top centre, extremely well done and can only be seen on close inspection.